We are Your Source for Upscale, Unique Outdoor Living Space Designs — Including She Sheds! She Shed in Columbia, SC, built by Archadeck of Central SC. Archadeck of Central South Carolina is Columbia’s only outdoor living space design and build firm that specializes in truly custom structures. With this in mind, we are also the best company to contact if you have a unique, upscale addition in mind. 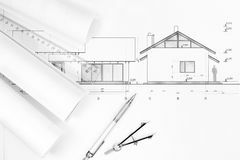 Where many builders only cater to plain-Jane, one-dimensional designs, we can design exactly what you have in mind to enhance your home and property and allow you to lead the outdoor lifestyle you crave! One such structure trending on social media and on the newsstands is the “She Shed.” A “she shed” is the woman’s answer to the “man cave.” This newest addition to the gender-specific outdoor sanctuary is a backyard haven for busy women seeking a quiet reprieve from the world. Whether it is for reading in solace, gardening, indulging in a hobby or just a place to take an afternoon nap, the popularity of the she shed continues to grow. Custom garden gate by Archadeck of Central SC. Many times, the impetus of creating a she shed in your own backyard involves updating an existing potting shed or neglected outbuilding located on your property into one of these glamorous backyard destinations. However, it doesn’t always have to be that way, as is evident through our she shed project in Columbia, SC. Archadeck of Central SC designed and constructed a custom she shed from scratch, and it was covered in an article chronicling the project titled “This garden shed in Columbia, SC, gives new meaning to having a place for everything and everything in its place.” Details of the shed include a concrete floor with a Hardie Plank Siding exterior and a standing seam roof. A cupola graces the roof to top off the exterior. Archadeck of Central SC was able to repurpose some existing windows the homeowners had left over from their home, and we even added a charming pergola detail atop the side window of the shed. The open rafter interior boasts an elegant chandelier, an air conditioner cools the space and multiple shelves serve many purposes. It is a workshop for painting, a protected storage space, a studio and a playhouse all rolled into one! Of course, the Columbia homeowners we created this unique space for are elated. To add even more charm to the property, in addition to the she shed we also installed a custom romantic-inspired gate reminiscent of those seen in English gardens of a by-gone era. This entire project is a great example of the individuality we pour into our custom designs. If you imagine it, we can build it! This outdoor fireplace addition in Elgin, SC, boasts a custom-designed and built TV cabinet meticulously finished to match the hardwood mantel of this space. This privacy screen addition in Columbia, SC, is loaded with exquisite details making this homeowner the envy of the neighborhood! 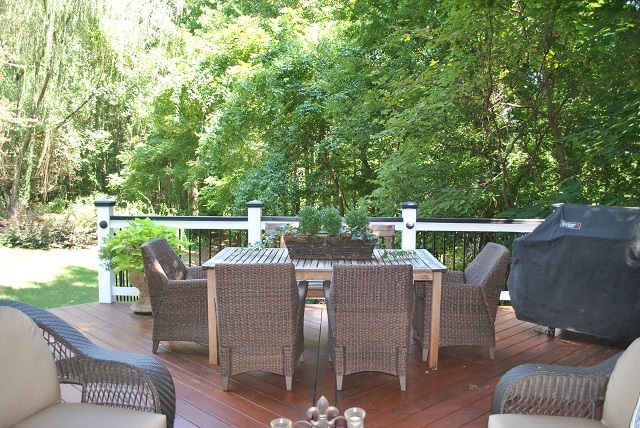 This wooden waterfront deck by Archadeck of Central SC sits on the Saluda River. Not only does the deck provide scenic views, we carefully designed the deck around the native boulders located on the property — giving it a unique, rustic charm! If you want to learn more about creating your own she shed, outdoor man cave or other one-of-a-kind outdoor space that stands out from the crowd, contact Archadeck of Central SC today to get started! You can contact us at (803) 603-2160 or via email at centralsc@archadeck.net. This entry was posted in Custom Garden Structures and Detached Outdoor Rooms, Custom Outdoor Living Designer & Builder, Custom pergola designs, Custom privacy screen options, Deck design, Lakefront and lakeside decks, Outdoor She Sheds, Unique Outdoor Living Structures and tagged Archadeck of Central SC, Archadeck of Central South Carolina, Columbia SC Unique Outdoor Living Space Designs, Country Living Magazine, Making your Columbia SC dream backyard a reality, Move over "Man Caves" It's All About "She Sheds" Now, This garden shed in Columbia SC gives new meaning to having a place for everything and everything in its place on February 4, 2016 by archadeckofcentralsc. All pergolas are not created equal — our aluminum pergolas will exceed your expectations! Pergolas are very popular in the world of outdoor living design. Pick up any home & garden magazine or tune into a home improvement show and chances are you will see many pergolas featured within. Pergolas can be designed and built to serve as a valuable functional shade structure and can also serve as a dramatic focal point within your outdoor living space. It is true that pergolas are, from a design standpoint, quite easy on the eye — however there is more to their substance than serving as just another “pretty face” in your outdoor setting. 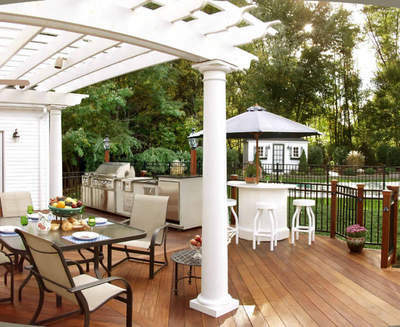 Archadeck of Central South Carolina has helped many homeowners realize the versatility of a pergola in their back yard singularly or combined with another outdoor living structure such as a deck or patio. We build pergolas in all shapes and sizes utilizing many different materials such as wood, vinyl and aluminum. 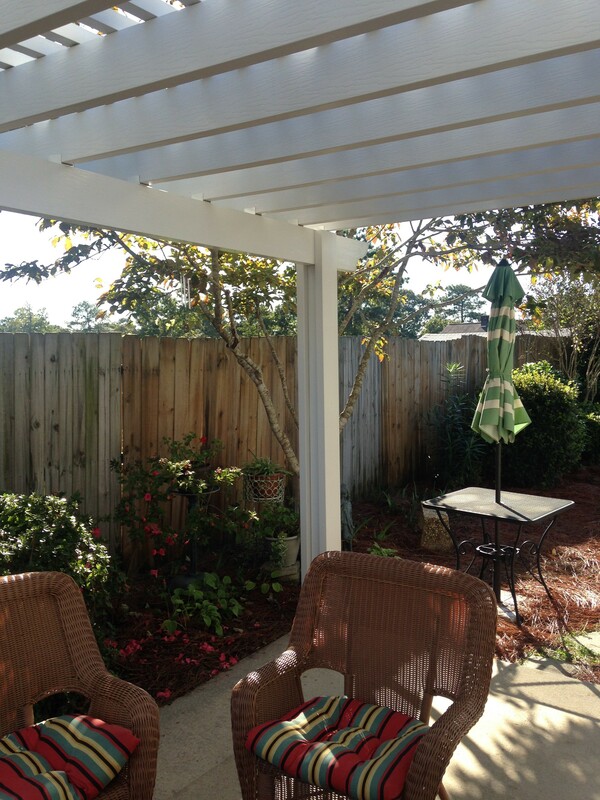 Low-maintenance pergola installation in Blythewood, SC. Our aluminum pergolas are low-maintenance, meaning they won’t ever rust, tarnish or degrade like other materials. They also have a wood-like texture composed of a multi-coat baked-on finish that doesn’t need painting, won’t warp, crack or split and is termite resistant. All of these features deliver a structure with exceptional durability and endurance that is highly desirable for exterior projects…easily outperforming wood or vinyl. An added benefit of these aluminum pergolas is the wide selection of shapes, sizes and colors we have available. These options include sun protection from forty to sixty percent based on the spacing of the beams. The pergolas are also available in ten beautiful colors as well as custom colors of your choice. End-cut options for the beams and rafters include scallop, bevel, miter and corbel shapes to add character and distinction to your backyard! A pergola can be a cost-effective way to add charm and style to your outdoor living space while serving as a unique shade structure. Contact Archadeck of Central South Carolina to learn more about our various pergola styles and materials to create your own one-of-a-kind pergola. (803) 603-2160 centralsc@archadeck.net. This entry was posted in Aluminum Pergolas, Custom Outdoor Living Designer & Builder, Custom pergola designs, Outdoor Living, Pergolas and Trellises and tagged Archadeck of Central South Carolina, Blythewood Pergola Builder, Central SC outdoor living combination builder, Central SC pergola builder, Columbia pergola builder, Columbia SC Aluminum Pergola Designs, Columbia SC low-maintenance pergolas, Columbia SC pergola builder, Columbia SC romantic pergolas, Columbia SC rustic pergolas, Custom pergola designs, Pergolas and Trellises Archadeck of Central SC, West Columbia Pergola Builder on November 27, 2015 by archadeckofcentralsc. A pergola is an outdoor room with cross rafters and no walls that provides a light, airy and inviting space to relax, dine or just admire. If you’re looking to add something visually interesting to your backyard, a pergola is exactly what you need to provide a stunningly aesthetic centerpiece to your outdoor living environment. No matter the size or style, any outdoor living space will be dramatically enhanced by the added protection from the elements it provides as well as the striking complexity it will add to your existing structures. 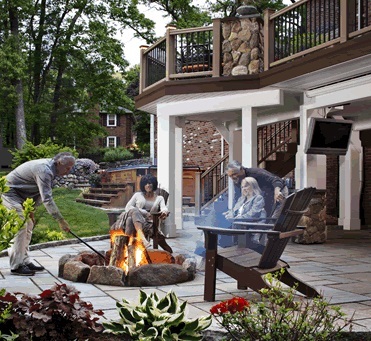 As a leader in the industry, Archadeck of Central South Carolina are the experts Columbia homeowners turn to for custom- designed and built outdoor structures and combination outdoor living spaces. Too often in the preliminary design stage, pergolas are overlooked because most people are simply unaware of the many benefits they offer. For instance, a pergola is the ideal structural addition to increase the character of your deck, patio and landscape because it introduces a vertical element that is often lacking. The feeling of a defined space – Four columns and cross rafters with no walls and a deck or concrete floor create an open-air outdoor room that’s great for eating, entertaining or lounging around with a magazine, offering more privacy than a deck or patio. Add drapes, screens or other materials to the pergola and you’ll have even more privacy. Shade – Be it with simple beams across the top, providing a roof-like structure, or fabric or lattice that creates an even more defined top cover. While pergolas don’t provide total shade, those beams or latticework do provide some relief from the intensity of the sun. At night, you can still sit under the pergola and see the stars. Block unsightly views – Pergolas are also useful for added privacy or for blocking unsightly views, like a neighbor’s hideous outbuilding or dead tree. Placing a pergola strategically will focus guests’ attention on elements of your property that contribute a sense of elegance to your backyard. Your own “green” initiative – Vines like clematis, ivy, wisteria or grapes all do well when planted around a pergola. Not only will climbing plants be an attractive addition to the structure, but they’ll also provide you with even more shade and privacy…not to mention the option of vertical gardening if space is at a premium in your yard. Protection from the weather – The fact that the pergola is not completely closed off like a regular roof means it’ll still have that outdoorsy feel without succumbing to the elements. If the plants are dense enough, a pergola can even protect you from the rain! 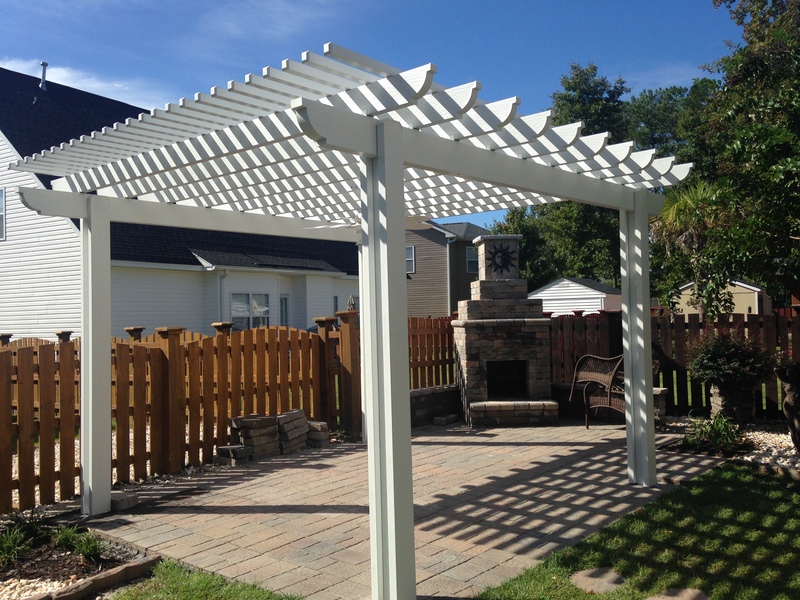 Throughout Columbia and the surrounding area, Archadeck of Central South Carolina has helped many homeowners see the extensive versatility of a pergola in their back yard used either as a single element or in combination with another outdoor living structure such as a deck. We build them in all shapes and sizes utilizing many different materials, such as wood or vinyl and even aluminum. Yes, aluminum! As you know aluminum is low-maintenance, won’t ever rust, tarnish, or degrade like other materials. Its wood-like texture is composed of a multi-coat baked-on finish that doesn’t need painting, it won’t warp, crack or split and it’s termite resistant. All of these features added together produce a product that has exceptional durability and endurance that is highly desirable for exterior projects…easily outperforming wood or vinyl. 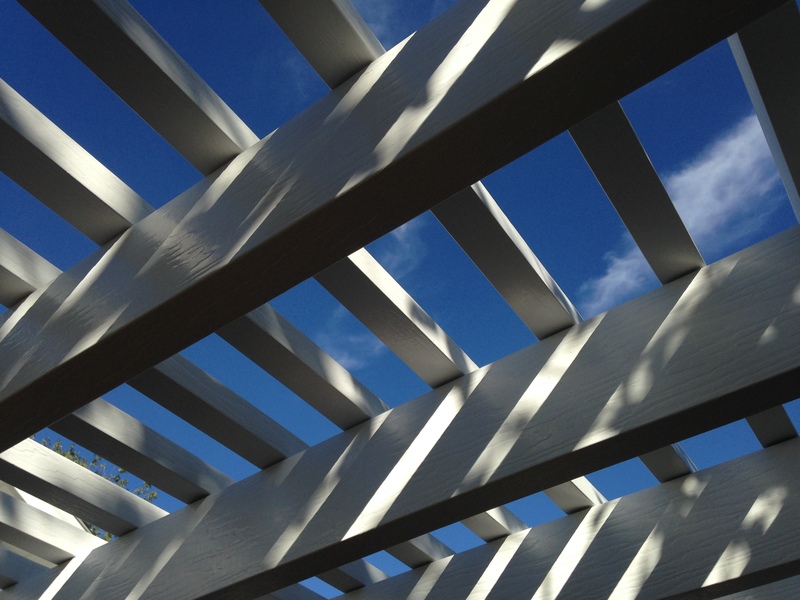 Beams and rafters help define the visual impact of your pergola. Our aluminum pergolas give you a choice of four custom end-cut options and a wide range of design possibilities. We offer these aluminum pergolas in a variety of shapes, styles and colors. The shading style options allow anywhere from forty to sixty percent protection from the sun depending upon the spacing of the beams and is part of the design selection for the Open Style and the Combination Style pergola. The Open Style is the traditional open lattice, while the Solid Style is a fully covered pergola top which is impervious to rain. For the ultimate in all options, the Combination Style allows you to intermingle open and solid patio covers. For shapes and colors, our end cut options for the beams and rafters include: scallop, bevel, miter and corbel shapes with a color selection of designer hues to match and coordinate with any existing structures. Versatility at its finest, there are many ways a pergola can dress up a backyard. A pergola can be a cost-effective way to add character and style to your outdoor living space while serving as a unique shade structure. Contact Archadeck of Central South Carolina to learn more about our various pergola styles and materials to create your own one-of-a-kind pergola. (803) 603-2160 centralsc@archadeck.net. This entry was posted in Aluminum Pergolas, Custom Outdoor Living Designer & Builder, Custom pergola designs, Pergolas and Trellises and tagged Archadeck of Central South Carolina, Blythewood Pergola Builder, Central SC outdoor living combination builder, Central SC pergola builder, Columbia pergola builder, Columbia SC Aluminum Pergola Designs, Columbia SC low-maintenance pergolas, Columbia SC pergola builder, Columbia SC romantic pergolas, Columbia SC rustic pergolas, Custom pergola designs, Deck and pergola combinations, Outdoor Living, Outdoor living combination structures, Pergolas and Trellises Archadeck of Central SC, West Columbia Pergola Builder on October 13, 2015 by archadeckofcentralsc. There’s more to Archadeck of Central SC than just decks, much more! There are many people who presume Archadeck is only a deck builder. For obvious reasons, as the term “deck” is evident in our name. Yes, decks are a major element of the many custom outdoor living spaces we specialize in, and it is how Archadeck began almost thirty-five years ago, but we are so much more than just North America’s largest deck builder. Our outdoor living space designs continue to evolve and diversify with the changing lifestyle needs and desires of today’s homeowner. Here at Archadeck of Central SC we specialize in outdoor living spaces. Our objective, with all of our custom designs, is to bring the outdoors in. 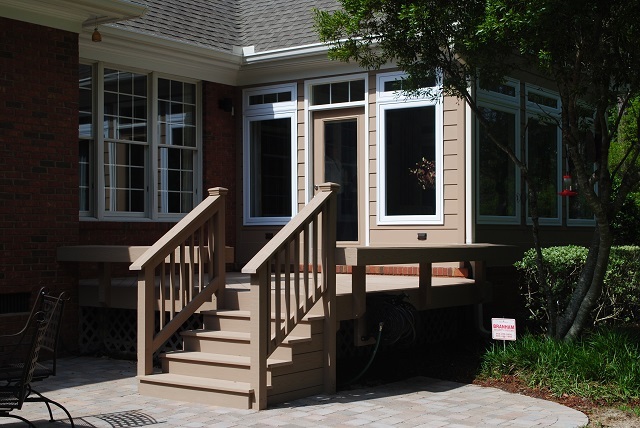 For over twelve years our talented professional team has provided homeowners in Columbia, SC, and the surrounding area with decks, porches, patios and outdoor rooms that fulfill your needs and desires. We’re proud to say we don’t offer a catalog full of ready-made decks, nor do we charge by the square foot. Every design is one-of-a-kind and custom-made for you. 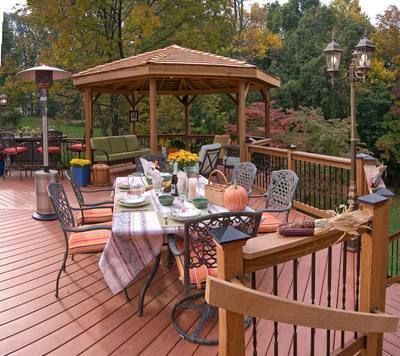 Archadeck Outdoor Living started building decks in Richmond, Virginia almost thirty-five years ago. The company quickly became the nation’s largest builder network specializing in custom-designed and custom-built decks, screened porches, sunrooms, gazebos and related outdoor living structures. Archadeck is set apart by our approach to design, with local teams of design consultants across North America specializing in creating custom projects for our clients’ outdoor living spaces. 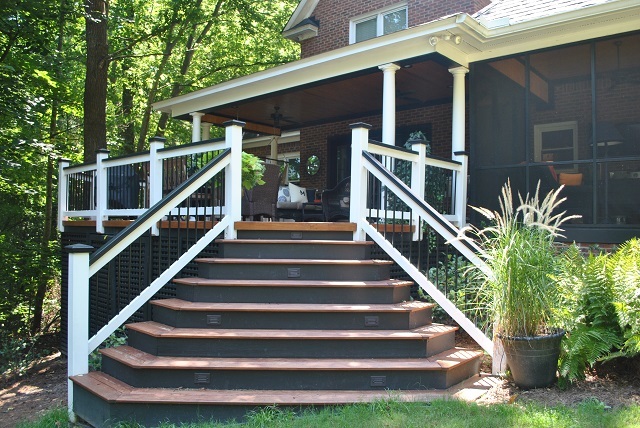 As a leading national deck builder, we’ve always been known for creating additions that seamlessly work into the existing design of your property, building new decks, porches and pergolas that look as if they were always part of our clients’ homes. No “cookie cutter” designs from us! Designing an outdoor living space requires much more skill, expertise and experience than just throwing up a backyard deck for a client. 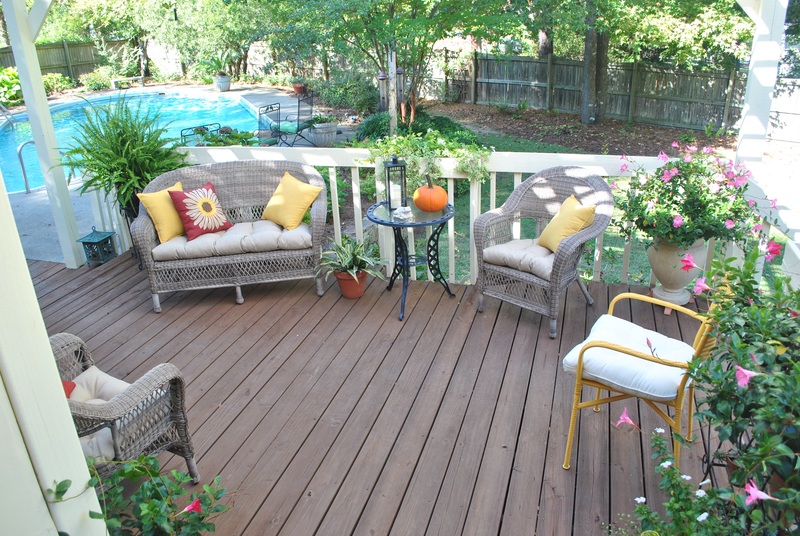 More than any of these factors, it also requires the ability to truly “listen.” The difference between just getting another deck, porch or patio and a living space is a project that is designed with the lifestyles of the individual clients and their needs in mind. A cookie-cutter, builder-grade deck does not deliver the same results. Not all outdoor structures are created equal. Just because you have an outdoor structure doesn’t mean you have an outdoor living space. This entry was posted in Custom Garden Structures and Detached Outdoor Rooms, Custom Outdoor Living Designer & Builder, Custom pergola designs, Custom privacy screen options, Deck design, Deck to outdoor room conversions, Fireplace, Gazebos, Outdoor fireplace and fire pits, Outdoor Kitchens, Outdoor living combination structures, Outdoor Rooms, Patio, Screened Porches, Sunrooms, Three and Four Season Rooms and tagged Archadeck of Central SC, Archadeck of Central South Carolina, Central SC combination outdoor living spaces, Central SC deck builder, Central SC outdoor rooms, Central SC outdoor structure experts, Central SC pergola builder, Central SC porches, Columbia SC four season room builder, Columbia SC outdoor living, Columbia SC Porch Builder, Columbia SC Sunroom Builder, Columbia SC three and four season rooms on December 22, 2014 by archadeckofcentralsc. From hosting an oyster roast, to an outdoor dinner toast, autumn is full of outdoor living opportunities! 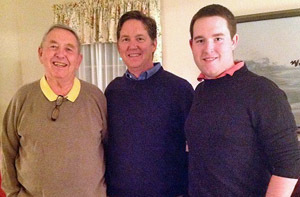 Central South Carolina’s mild climate allows us to enjoy the outdoors well into the late fall and beyond. Warm winter days, and the occasional “Indian Summer,” extend our chances to soak up the sun on the backyard deck, or enjoy brunch on the screened porch. 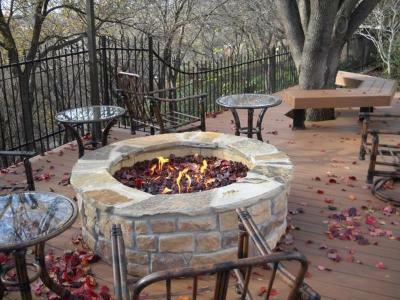 These are the times we often love the most; out of the ordinary and flowing against the grain of the typical outdoor living season when we are able to toast marshmallows over the outdoor fire pit in January, or enjoy a glass of wine with friends nestled beside the outdoor fireplace in late November! It almost seems unfair to those who live in less friendly climates, doesn’t it? Thus is the glory of living in the South! Sit down and stay awhile – You can take full advantage of the cooler season by creating a cozy outdoor space where you can relax and take time to experience the aromas, sounds and colors of autumn. A good way to achieve this feeling is to think about seating. For example, consider a patio with a integrated seating or retaining wall which helps define your space and offers casual seating. Ample outdoor furnishings on your porch or deck are also a crowd pleaser. Comfortable seating is always key to enjoyment in your space and means you and your guests will be more likely to linger. Sofas and chairs with removable cushions made of higher-quality outdoor fabric will hold up to the elements and are a worthwhile investment returning years of enjoyment. Go “under cover” – Having at least a portion of your outdoor living space under cover will allow you to get more use out of the space, even on cool, rainy days. 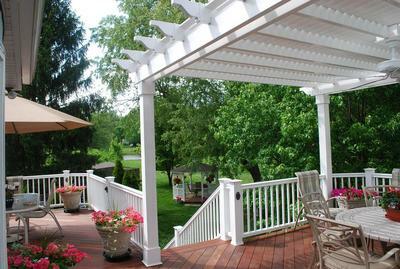 Consider adding a pergola or covered porch to your deck or patio. Unlike summer, when the need for covered areas to provide shade is critical, sunny days in autumn are much more welcome. Host a gourmet gathering under the stars – Entertaining friends and family, and especially dining, is more fun outdoors. Today’s wide range of outdoor dining amenities make it effortless. Outdoor kitchens are becoming more and more common paired with patios, porches and decks. Outdoor fire features offer a great way to introduce food into your autumn celebration. From roasting marshmallows over the fire pit, to hosting an oyster roast on the patio and enjoying an after dinner toast, autumn is full of outdoor living opportunities! This entry was posted in Custom Garden Structures and Detached Outdoor Rooms, Custom Outdoor Living Designer & Builder, Custom pergola designs, Deck design, Outdoor fireplace and fire pits, Outdoor Living, Outdoor living space design and building, Outdoor Rooms and tagged Archadeck of Central SC, Archadeck of Central South Carolina, Central SC combination outdoor living spaces, Central SC deck and porch outdoor living combinations, Central SC deck builder, Central SC outdoor rooms, Central SC porch builder, Columbia SC hardscape and patio outdoor living spaces, Columbia SC outdoor fireplaces and fire pits, Columbia SC outdoor kitchens, Columbia SC outdoor living, Columbia SC Porch Builder, Fireplaces, How to host an oyster roast, How to make the most our of your Columbia SC backyard this fall on October 28, 2014 by archadeckofcentralsc.